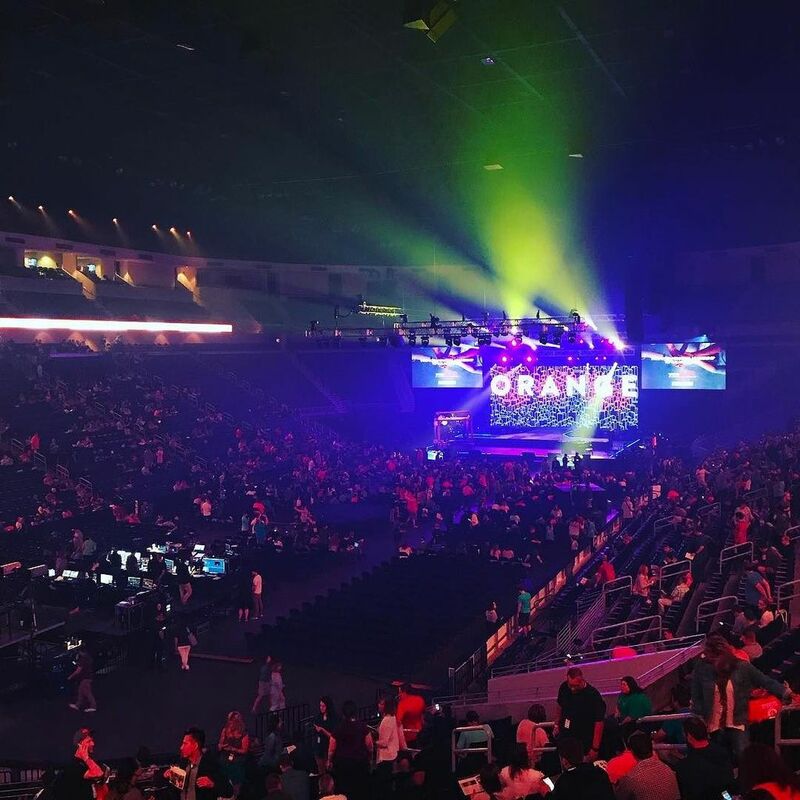 The Opening Session of Orange was chock-full of great information. It was challenging and inspiring, all at the same time. In addition to great music, there was dancing, laughing and tons of fun! But beyond all of that, there was solid content. 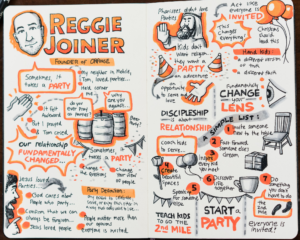 As always, there were a variety of speakers prior to the main speaker (Reggie Joiner) and each one was dynamic, engaging and intriguing. Jon Acuff was the first speaker to take the stage. He made us laugh but in true Jon Acuff fashion, provoked us to think as well. From there, we heard from Carlos Whittaker, Gerald Fadayomi, Danielle Strickland and Reggie Joiner. Here are a few of my favorite “mic-drop” moments! Carlos Whittaker – Neighbors don’t let parents parent alone. Gerald Fadayomi – The next generation needs someone who’s gone before them to be for them! Danielle Strickland – When we are for our neighbors, we learn how to really see other people. Everyone saw a blind guy – Jesus saw glory to God. People saw a prostitute, Jesus saw a leader. People saw an enemy, Jesus saw a neighbor. Moses’ parents saw something. Think about it, these are two people who are hardly mentioned in the Scriptures, but somehow they got into Hebrews 11. How? Because they saw that Moses was no ordinary child. They saw like Jesus. We need to realize and see like Jesus – that there are no ordinary children! What would happen if we started to see all kids as a blessing from the Lord? Foster children, troubled kids, special needs kids… instead of too hard, we saw an opportunity. We need a kingdom lens!!! 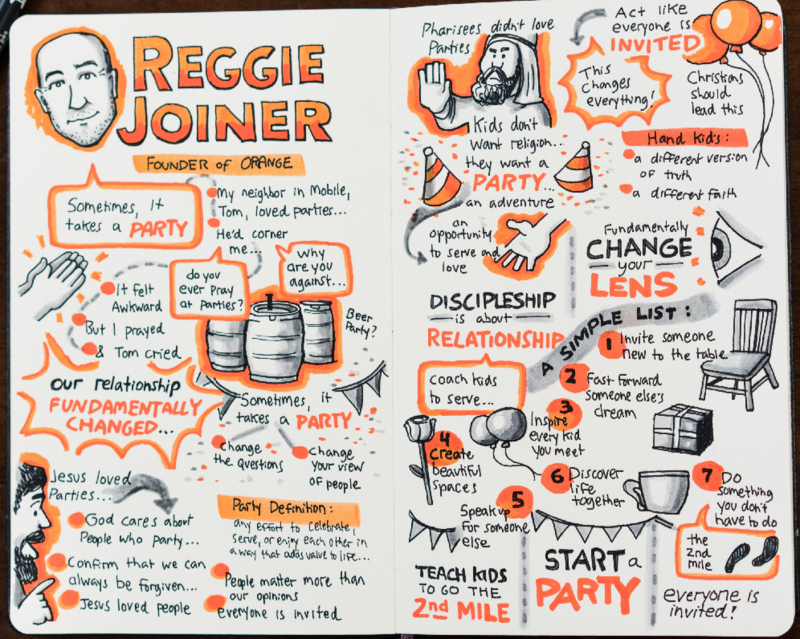 Reggie Joiner – Start a lot of parties. Sometimes it takes a party. Jesus went to parties. He turned water into wine. He described the massive party that the father of the prodigal son throws. He invited himself to parties… for example – Zacchaeus’ house and Matthew’s house. Jesus loved parties b/c Jesus loved people. Sometimes it takes a party to change how we see each other. Sometimes it takes a party to demonstrate that God cares about people who party. Sometimes it takes a party to prove that people matter more than our opinions. Sometimes it takes a party to remind us all that everyone is invited to the party. What if you started acting like everyone is invited to the party? This could change everything. Kids & teenagers need to hear us explain that everyone is invited to the party. The church is guilty of acting like not everyone is invited to the party. If we change that – we could give this generation a new view of the church, of God. This generation does not want a religion – they want a party, an adventure, an opportunity to serve and love. Pharisees were models in every way (read the Scriptures, knew the Law, lived it out) except in how they loved their neighbor. Shift what we do with this generation so we can coach them to love others. We have been programmed to teach kids what to believe but not to coach kids how to love and serve. Invite somebody new to the table (not someone you don’t know – someone who is not like you). Fast forward someone else’s dream (start a party that’s not about you). Invest in other people rather than your agenda. Inspire every kid you meet. Why? Because – Jesus said to do this. Welcome a kid – welcome Jesus. Have a two-minute party with the kids you see. Make them laugh, dream, etc. Create beautiful spaces!!! It tells people you were expecting them. Prepare for people coming to the party. Show up as the church and help neighborhoods rebuild things. Speak up for someone else. If you have a voice, you have some kind of influence. Advocate for those who are hurting. We (the church) should be the first people to show up to address racial tension, help kids in foster care. NO POLITICAL PARTY can heal your neighborhood. Do something you don’t have to do. Get in the habit of doing this. Go the second mile. Too often we teach children to simply fulfill the obligation, without going the second mile. It’s the second mile that changes things.